Etihad Towers is a luxury development on the Corniche set over five tower blocks, which include commercial offices, 884 apartments and penthouses, and a hotel run by the Jumeirah Group. 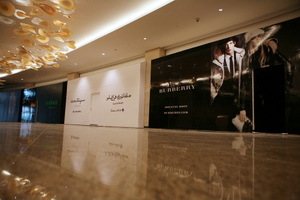 The retail space is on the ground floor and is intended to attract a mix of tourists and local residents. But the project is set to open in an increasingly competitive retail environment in Abu Dhabi, with hundreds of thousands of square metres of retail space having been built this year or expected to be operational in the next three years. Aldar is building two major projects, Yas Mall and the Emporium at Central Market, and the Emke Group opened Mushrif Mall this year. But analysts say Abu Dhabi has been looking for a luxury retail offering such as that at Etihad Towers, which is the first of its kind in the city. “I think the whole development is aimed at the luxury market. That’s really what this development is about,” said Matthew Green, the head of research and consultancy for the UAE at the property consultancy CB Richard Ellis. He added that retailers at Etihad Towers would not require high numbers of shoppers to enjoy a successful business. Alan Jones, the managing director of i-en Consulting, a retail, leisure and property consultancy, says the retail at Etihad Towers is likely to be a success, but could come under pressure in the long term.